Making important life decisions on issues such as where to live and how to spend one’s money is a measure of autonomy that adults generally take for granted. The ability to exercise such control reflects the commonly-accepted belief that adults have the experience and knowledge necessary to make these decisions in a reasonable manner. Unfortunately, there are those circumstances when a person is unable to make these decisions due to physical or mental impairments that affect his/her capacity to make sound choices. Also, minor children, under eighteen years of age, cannot legally own property, enter into contracts or handle their own affairs. The law responds to these situations by appointing a Guardian to oversee a person’s financial and/or personal affairs. Guardians are appointed by a court, for adults adjudicated incompetent and for minor children who become entitled to property in excess of $15,000 or whose parents are deceased, incompetent or otherwise unavailable. A Guardianship case may continue for many years. A guardian is required to be represented in court, at all times, by a Florida lawyer. Most decisions made by the Guardian will require court approval. The appointment of a Guardian may serve an important purpose, but it is expensive and intrusive, and can often be avoided with proper legal planning. Even if a guardianship is necessary, it is important to make proper advance arrangements for the court to appoint the individual that you have selected as your guardian. No one knows when the circumstances might arise that could make a guardianship necessary. Thus, planning for such a possibility in advance is essential. The function of a guardian and the legal options available to select a person for appointment before one is necessary will be discussed below. As outlined above, a guardian functions as a surrogate decision-maker over another person’s financial and/or personal affairs when that individual becomes incapacitated and is no longer capable of making such decisions alone. Because this arrangement involves the transfer of important rights to someone else, a court must first determine if a guardian is necessary, and must maintain oversight of the arrangement to ensure the guardian is acting in the person’s best interests. The extent of the authority granted to the guardian is based upon the type and level of incapacity suffered by a particular individual, and can be limited to only personal or financial decisions as well as encompassing both areas. A guardian is appointed when no less restrictive alternative is appropriate, such as a healthcare directive or power of attorney to manage a person’s affairs. Further, Florida law authorizes both involuntary and voluntary guardianships. Voluntary guardianship refers to an adult that petitions for guardianship in spite of being mentally competent because he/she believes they cannot effectively make certain decisions. Because of the sensitive and invasive nature of guardianships, Florida law grants residents the ability to designate a guardian in advance of the need for such services. This designation is called a preneed guardian, and a competent adult can select someone by executing a written document that names a particular person. The document must be signed by the declarant and two witnesses. This document can be filed with the court, and as soon as the person is deemed incompetent by a court, the person named to serve as guardian can immediately assume his/her duties. The court does have to confirm the appointment, but absent a glaring issue, the approval is fairly standard. If a preneed guardian was not selected, the court must independently decide who to select. Any competent adult, who is a Florida resident and over the age of 18, is generally qualified to serve as a guardian. Non-residents must be related by blood or marriage to the incapacitated person to qualify. However, when considering who to appoint, courts first look to family to fill this role, as well as any expressed wishes of the incompetent individual. If no one is available or willing, the court then looks to someone with the experience to meet the needs of the incapacitated individual. Relinquishing your rights to make decisions over your own life is never easy, but putting yourself in the position to have some influence over the process ensures your wishes and best interests will be protected. 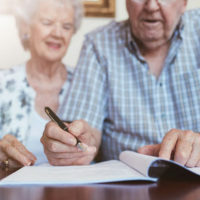 The Oldsmar law firm of attorney William Rambaum, a Board Certified specialist in Elder Law, can assist you with setting up a plan to protect your financial and health needs. Contact the office to schedule an appointment.